Articles from the first edition of the Annual Review of Linguistics are appearing online this week. Bob Ladd, Dan Dediu and I wrote a review of correlations in linguistics. We review a number of recent studies that have identified either correlations between different linguistic features (e.g., implicational universals) or correlations between linguistic features and nonlinguistic properties of speakers or their environment (e.g., effects of geography on vocabulary). We compare large-scale quantitative studies with more traditional theoretical and historical linguistic research and identify divergent assumptions and methods that have led linguists to be skeptical of correlational work. We also attempt to demystify statistical techniques and point out the importance of informed critiques of the validity of statistical approaches. Finally, we describe various methods used in recent correlational studies to deal with the fact that, because of contact and historical relatedness, individual languages in a sample rarely represent independent data points, and we show how these methods may allow us to explore linguistic prehistory to a greater time depth than is possible with orthodox comparative reconstruction. Whether researchers are for or against these new techniques, understanding them is becoming increasingly necessary to interface with discussions in the field. One of the most fun parts of putting the paper together was drawing this diagram (below) of all the links that we discuss. 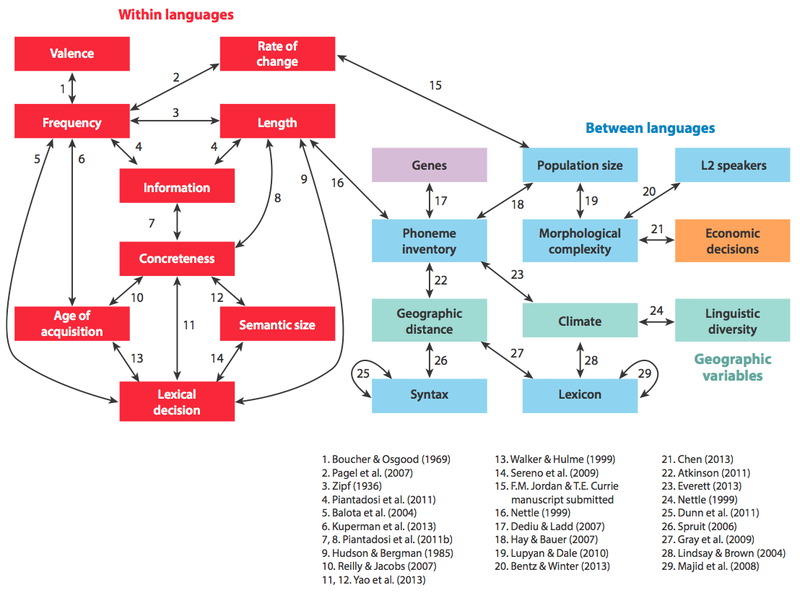 It turns out that there are a lot of complicated links between linguistic and social variables! I’m currently working on methods to disentangle this web. We also include three appendices as supplementary materials. First, a list of electronic databases relevant for cross-cultural statistical comparisons. Secondly, a very brief introduction to statistical hypothesis testing, which could be useful for linguists who are not familiar with statistical approaches. Thirdly, a discussion of robustness and validity in statistical approaches to linguistics. Other reviews also look interesting, for example, Johansson on Language abilities of Neandertals, Fisher and Vernes on genetics and linguistics, de Vos on village sign languages and Kroll et al. on bilingualism.